this meal was inspired by an episode of rachael ray that i watched titled “hot and sweet asian fest.” i’ve never seen an authentic asian restaurant make orange-sesame pork chops with teriyaki whole wheat noodles, but heck, i’ll try making it. i didn’t really follow rachael’s recipe at all, but basically borrowed her idea (especially the edamame in noodles part) and made it my own. 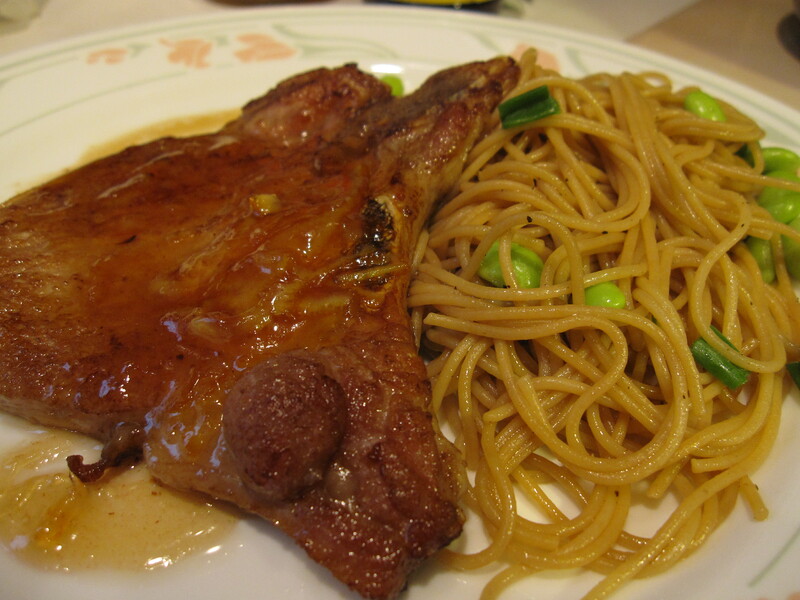 i marinated the pork chops in my usual soy sauce, sesame oil, and vinegar mixture for 10 minutes. seared the pork chops in peanut oil (good for frying at high temperatures) for 2-4 minutes each side. i removed the pork chops from the heat and added one large tablespoon of orange marmalade to the pork chop drippings. once the marmalade was dissolved, i poured the glaze over the pork chops. for the noodles, i boiled whole wheat thin spaghetti pasta for 5 minutes, then added half a cup of edamame to the pot until the water boiled again. drain both the pasta and edamame. add chopped green onions, soy sauce, sesame oil, vinegar, and spicy chili sauce. verdict? the orange glaze + soy sauce marinade tasted like a nice, tangy bbq sauce. i’ll definitely make it again. the noodles? hmm…not really a fan of whole wheat noodles, because they don’t absorb sauce very well. i’ll stick to regular noodles next time. Don’t have orange marmalade.. would it taste just as good with strawberry jam?? to your first paragraph in the “mushroom ravioli” post. Two words. ME TOO! I’ve wondered if anyone else out there actually enjoys standing over the stove and oven like i do haha. over the years, its become that place where 3 hours go by like nothing and its a haven away from the rest of life for a lil bit, I feel ya!